Brilliant Gloss is a non sticky lip gloss with vegetal-based cross-linked sugars that naturally and safely plump lips. Brilliant Gloss helps keep lips hydrated while imparting lasting color and brilliant, shine. Always shiny, never sticky. An innovative system of elastic polymers and shiny emollient oil creates long-lasting wear. Enhanced with green tea to protect and calm lips. It is not everyday that I buy tons of high end, luxury makeup, especially Lip gloss, as they are my least used beauty product. Also, I don't get PR samples. So when I buy a crazy expensive lip gloss (without Coupons) I do my share of search and re-search. Chantecaille is a pricey brand and is sold at Nordstrom, Neiman Marcus. So there are no Friends and Family coupons to bear the dent. 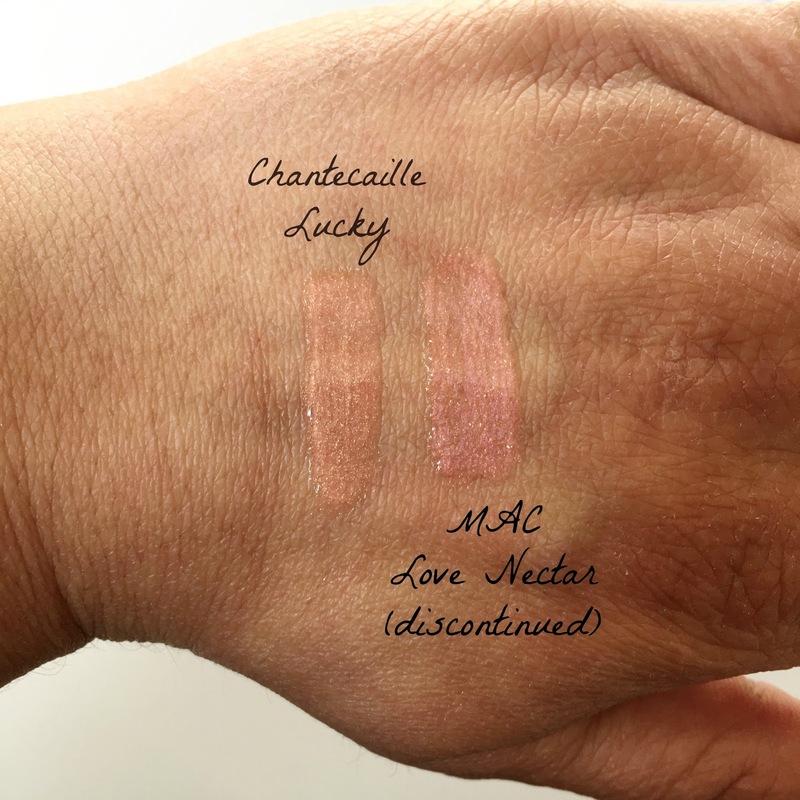 I have used 4 products till date from Chantecaille and every single of them have been good. This one is no exception. Scent: None detected which is strange because all lip glosses have some scent! Application: I just apply a thin layer of this lip gloss, concentrating more on the center of the lips. Feel and Effect on the Lips: It feels so light on the lips. There is no minty or tingling sensation. It does not sinks in those fine lip lines. A thin layer of the gloss is enough to give a juicy, high shine, glossy lips. It is not at all sticky and the gloss lasts for quite sometime. The shimmers are really fine and they don't travel all around the mouth. Packaging: A regular lip gloss tube with a brush applicator. I don't mind a doe-foot applicator, but the brush makes it more easy to apply and control. Verdict: I love everything about this gloss. It makes the lips look full and juicy. The gloss has very fine shimmers, that are so well dispersed. There are no chunky glittery stuff. The shimmers give it a high shine that does not look cheap at all. The shade Lucky layers pretty well over any lipstick. The gloss lasts for a good amount of time. It does not disappears, is not sticky or goopy. There is nothing negative I have to say about this one. Well, the answer is always the same. Price is subjective. The product delivers and is lovely. I would prefer one good, slightly expensive product over 5-7 not so good, cheap products. Also, lip gloss is a liquid product with a shelf life, so I would not collect millions of mediocre ones. One or two awesome ones are just fine.